When you think of promotional sweets do boring mint imperials come to mind? You know, the sort of sweets that you tend to get on hotel reception desks, in conference rooms and at exhibitions. Some companies seem to think that sticking their branding on boring promotional sweets will help their image with their customers. After all if you can't make promotional sweets fun and memorable... what promotional giveaway items can you make interesting? A carrier bag? Or a mouse mat? Whether your customers are young or old, there's a very good chance that they used to frequent their local sweetshop when they were young. And that they have fond memories of the sweets they used to buy with their pocket money as a child. So just imagine how they will feel when you give them a promotional gift of the very same sweets... the sweets they probably won't have seen or tasted for 20, 30 or even 40 years. Just think how you would feel in that situation... you'd love it. And you'd be sure to remember who gave you those promotional products, wouldn't you? Instead think Space Dust (remember that? 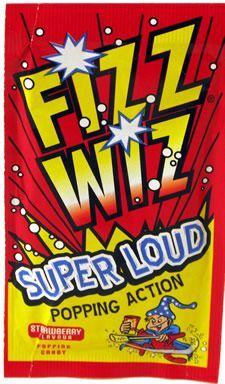 the stuff that explodes when you put it into your mouth... it was all huge in the 1970s! ), Rhubarb and Custard, Anglo Bubbly Bubblegum, lollipops... the options are almost endless. And no-one knows more about retro sweets (or retro sweets as promotional sweets) than we do. Which Sweets Will Work Best For Your Promotional Sweets Requirements? That's a toughie, because there are so many to choose from. Fortunately for you we have a shedload of experience of supplying the top high street names with fabulous promotional ideas. So even if your requirements are only sketchy, we can help you. Of course, if you do want conventional promotional sweets in personalised wrappers, or sticks of rock with your logo running through... or lollipops with your company branding on, we can help you with those too. Not a problem at all. But if you are looking for something a bit different - cheap promotional items which make cost effective business promotional products, then we can definitely offer you something a bit special. Can We Supply Promotional Sweets To Match your Theme? Just try us... and see. If we can't then nobody can. If you have a particular colour scheme that you want to match... just let us know and we'll tell you what we recommend. If it's boiled promotional sweets that you are after, we can have these made to your requirements - any colour, any flavour... and the minimum order levels are surprisingly low. If you need strange combinations then we can help you there too. How about blue strawberry sweets? That's an idea for promotional sweets that would make your customers take note! Themed Sweets - How About Animal Themed Promotional Sweets For Example...? We have (deep breath) mice, dolphins, shrimps, crocodiles, rats, frogs, starfish, turtles, spiders, bears, pigs and worms... plut quite a few other animal and insect shapes too! Oh and snakes too. And we can help with lots of other themes for promotional sweets too. Just tell us what your idea is, and we'll tell you what we can do. We have the best selection, a wealth of experience, incredibly helpful service... and fast turnaround times. Either give us a call on 01254 262160 or use our quick and easy enquiry form on our dedicated promotional sweets website. Find out how we can help you to select promotional sweets that are cost effective and that your customers will love.